The events of Ghosts of Innocence and The Ashes of Home take place just over sixteen thousand years in the future. The location of Earth has long been lost by Shayla's time. Even its existence is little more than a legend, with histories and simple common sense hinting that humanity must have originally started off on just one world. Find out about Animastin, Shimmerblade, Chirple, and much more. Imperial terminology and technology, drugs and weapons defined. Explore the Imperial cruiser, Merciless, where Shayla was imprisoned after her attack on Magentis in Ghosts of Innocence. Imperial fast torpedo frigate Vixen. Without giving away plot spoilers, Shayla spends a fairly brief time imprisoned on Vixen before things go from bad to worse. Explore the ancient battleship which Shayla infiltrates in The Ashes of Home. 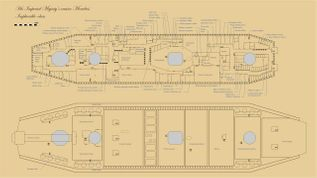 The floor plans of the Governor's Residence on Eloon, where a lot of the initial action takes place in The Ashes of Home. A brief introduction to the protagonists, antagonists, and sundry hangers-on. In all the human history and exploration leading up to Shayla's time, no extraterrestrial life has ever been discovered. All people, plants, and animals referenced originated from Earth. The cover of Ghosts of Innocence could easily have looked a lot different. Here are some early drafts of alternative cover concepts that I discussed with the designer. In Shayla's time, the official Imperial census records 523 inhabited systems. These are spread unevenly through a disc of space roughly two thousand light years across and five hundred light years thick. This is a tiny fraction of the galaxy, which is a hundred thousand light years across. To give some perspective on what this means for travelers, the fastest ship takes about two months to cross from one border of human space to the other. Of course, inhabited systems account for only a tiny fraction of stars in this region of space. The common convention, other than for navigational charts, is for maps to show only inhabited systems and to ignore the vast numbers of stars in between. Just over half of these systems are under the control of six Grand Families, either directly ruled, or through long-standing allegiances. The Family Skamensis is the strongest with 83 systems. The Family dom Calvino are the paupers at the table with a puny 27. The remaining systems are independent, or owe only transient allegiance, but with these six power-hungry sharks in the pool, independence is difficult and precarious. Some worlds are strong enough, either individually or by banding together, to keep the Grand Families at bay. At the other extreme, many "outworlds" on the periphery of civilization are too small and remote to be worth subduing. A privileged few, the Freeworlds, maintain their neutrality by treaty. Freeworlds usually have a dedicated purpose, or charter, and establish themselves as highly specialized centers of excellence for academics, artists, or artisans. The Families are prepared to honor the Freeworlds' independent status in return for the strictly impartial value that these worlds bring to all of humanity. It is no coincidence that Freeworlds also typically lack natural resources worth fighting over. I chose to express units of length in Imperial units - feet, yards, miles - rather than metric that people might feel more appropriate to a far-future space-faring civilization. This was done to give the story a deeper sense of antiquity. Of course, these are just storytelling analogues, because twentieth-century measures and languages will be long dead and forgotten by Shayla's time. How hard can it be for rulers to compare empires? How did we get here? A brief look at the backstory to Shayla's world.